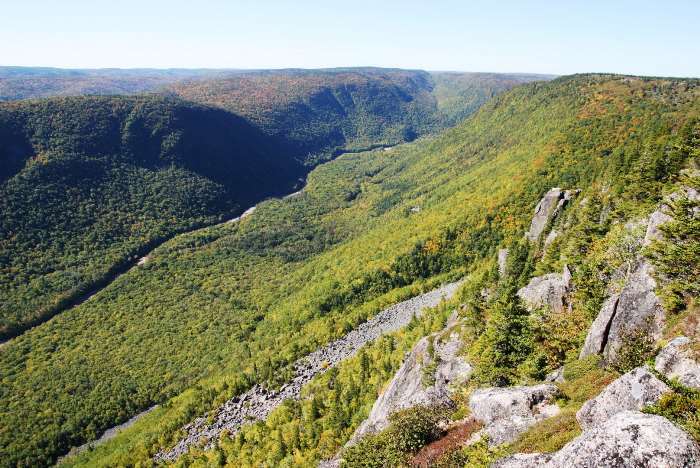 You’ll find one of Cape Breton National Park’s more challenging — and more rewarding — trails on the east side of the park, near Ingonish. 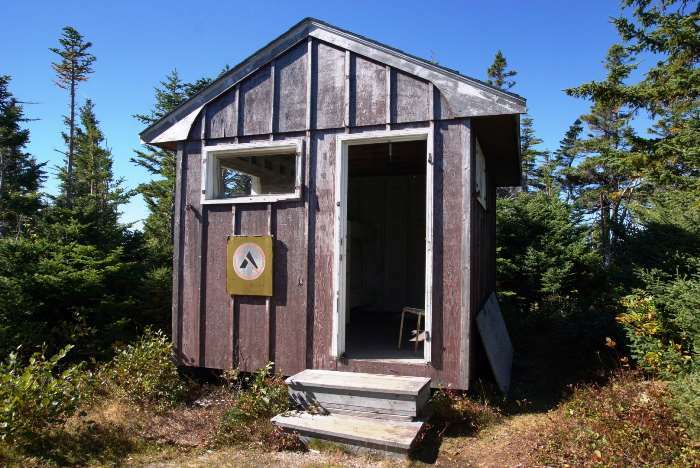 The Franey Trail is a 7.4 kilometer (4.6 mile) loop with a 335 meter (1,100 foot) elevation gain. You can see the reward for that effort in the photo above: a sweeping view of the Atlantic Ocean and Middle Head, and the chance to sit in a red chair and take it all in. 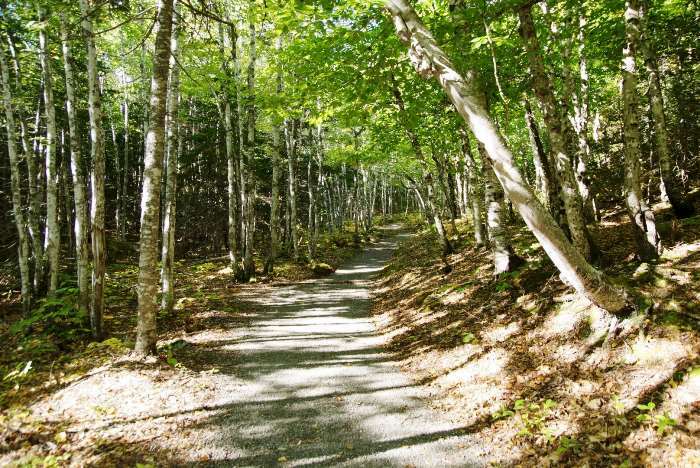 The trailhead for the Franey Trail is located down a side-road off the Cabot Trail, on the southeast side of Cape Breton National Park. If you’re headed north on the Cabot Trail, you’ll first pass the right-turn to Middle Head, and then you’ll see the left-turn to Franey. I decided to kick off Day 7 of the trip with a moderately-challenging hike. My B&B host strongly recommended the Franey Trail, and although it required about an hour of driving from Pleasant Bay, I figured it would be a nice drive, and I could explore some other parts of the island on the way back. 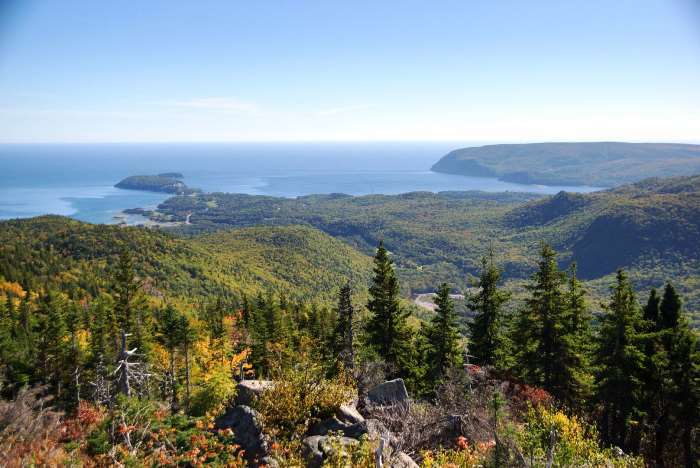 So, I made the drive down to Franey and started hiking. … there’s a halfway-decent viewpoint, that should help give you a lay of the land. 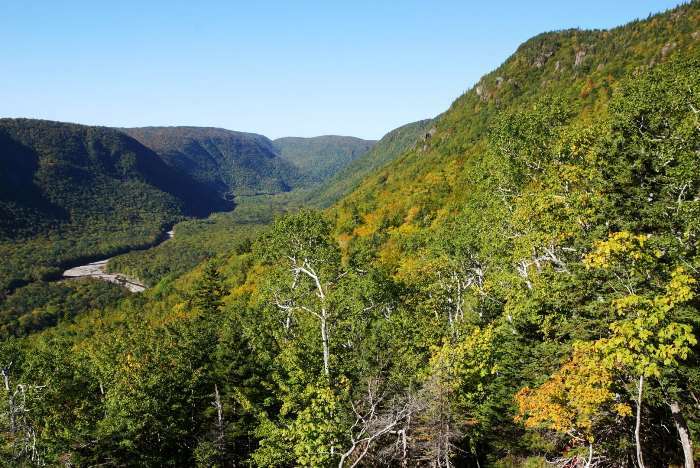 Here, the view looks west – away from the Atlantic Ocean — up the valley created by Clayburn Brook. We’ll see an even better view in this direction, later on. Also, notice that high point on the right side of the photo. That’s where we’re headed — or at least somewhere in that vicinity. I was really excited to see some fall colors on this trail. 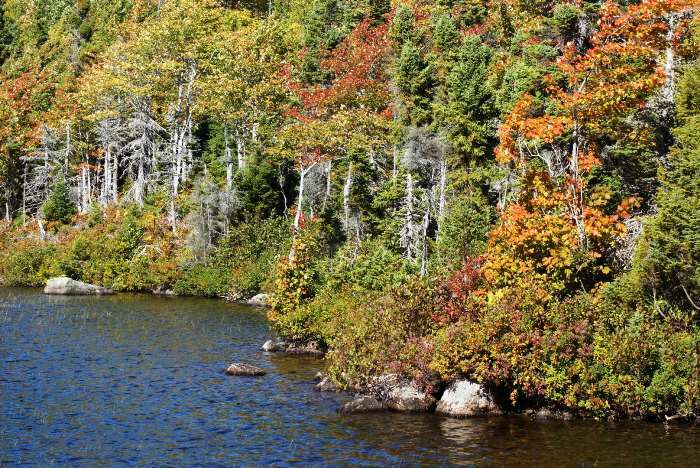 My visit to Cape Breton, on the first week of October, was just a few days, maybe a week or two, before the leaf-peeping reached its peak on the island. 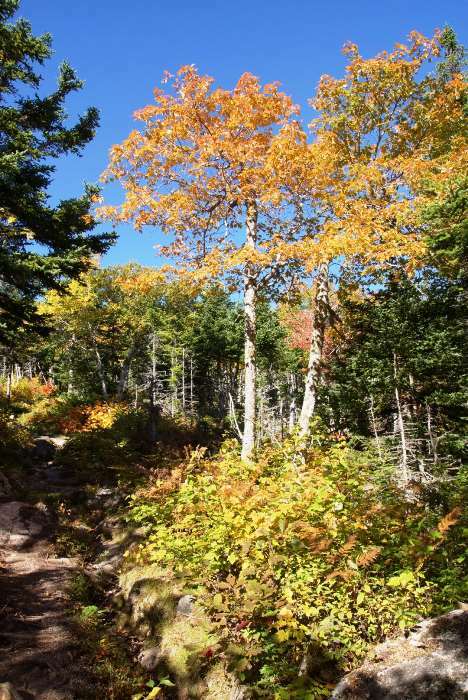 There were splashes of color in a few places, but on the Franey Trail, as I gained elevation, the leaves were looking better and better. The trail climbs and climbs. It’s not terrible, but I wouldn’t call it easy, either. 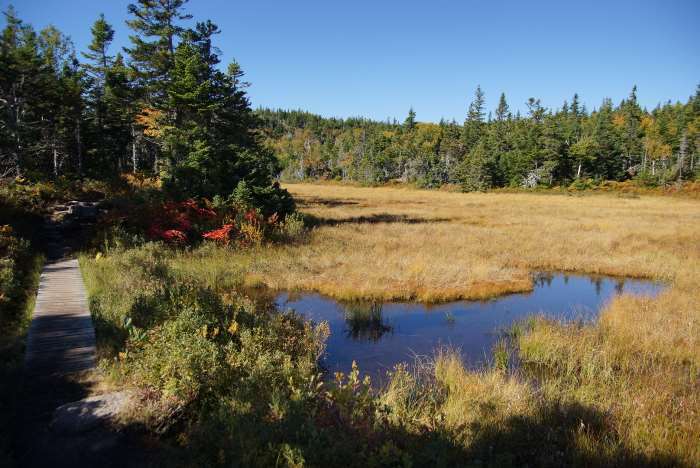 There are some spots where you catch a nice break, and the trail levels out — like at this marsh. I’m guessing it would be a good place to watch for wildlife, although I didn’t see any on my visit. … the sight you’ve been waiting for! A red chair! Parks Canada recently got the idea to place these chairs at some of the most scenic spots, at the end of some of the most demanding trails. It’s a marketing idea that’s paid off, because everyone instantly knows they’re supposed to take a selfie in the chair, and post it online. I was all alone when I arrived at this viewpoint, so I complied with the park’s expectations. I settled into the chair and took in the view, then took some photos. 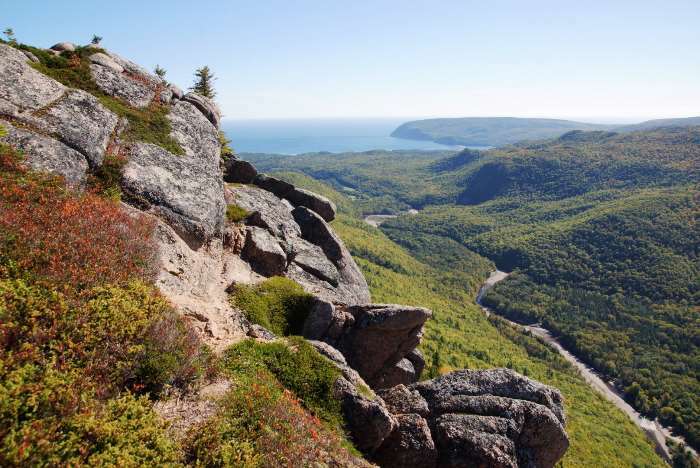 You’ll notice the view, looking straight out towards the Atlantic, includes Middle Head — and the trail I hiked on my first day in Cape Breton National Park. Just as I promised earlier, there’s an even better view looking west, up the Clyburn Brook Valley. 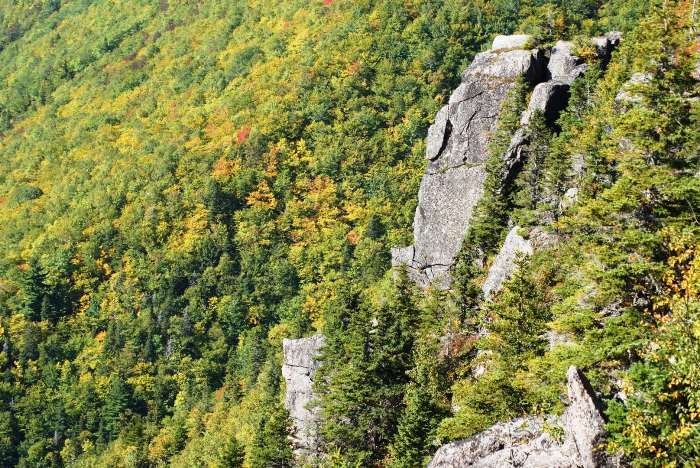 … which focuses more on the Clyburn Brook Valley, and the rock outcroppings on the side of the cliff. Just imagine how pretty this would have been in just a few days, when those slightly yellow leaves turned to even brighter colors! Even though they were desolate when I arrived, both viewpoints were now starting to get crowded, so I decided to move on. After the red chair viewpoint, the loop trail turns away from the valley. You’ll pass this old cabin (which looked pretty run-down and unpleasant inside). 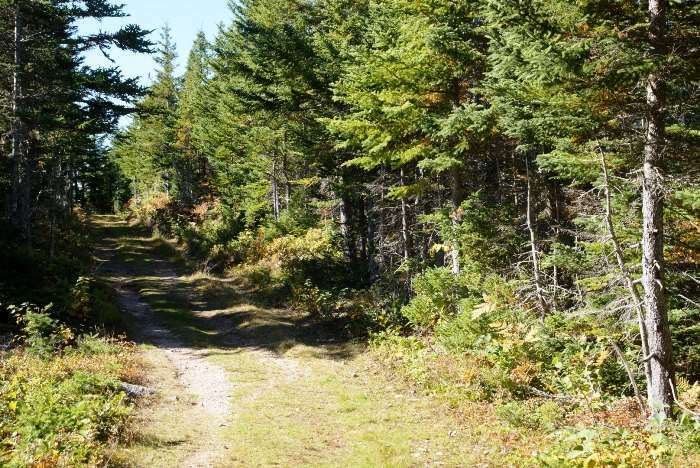 After the cabin, the trail is actually a double-track dirt road, that heads downhill, back to the trailhead. 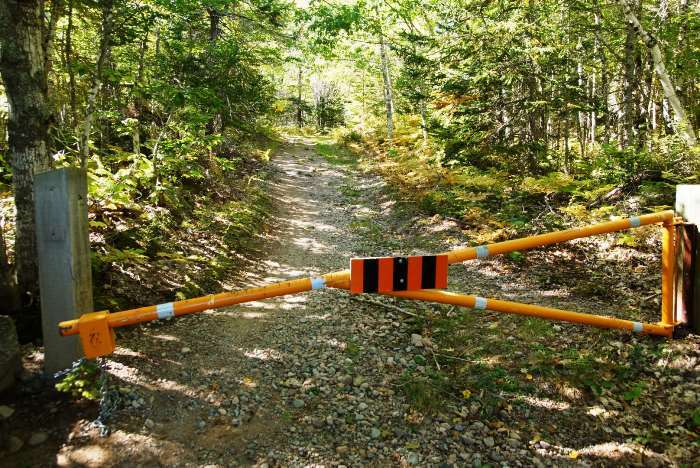 Essentially it’s the same road you drove in on, except it gets rougher beyond the trailhead, and traffic is restricted. If it wasn’t gated, you could drive all the way up to the viewpoint, which would be easier but not nearly as fun. 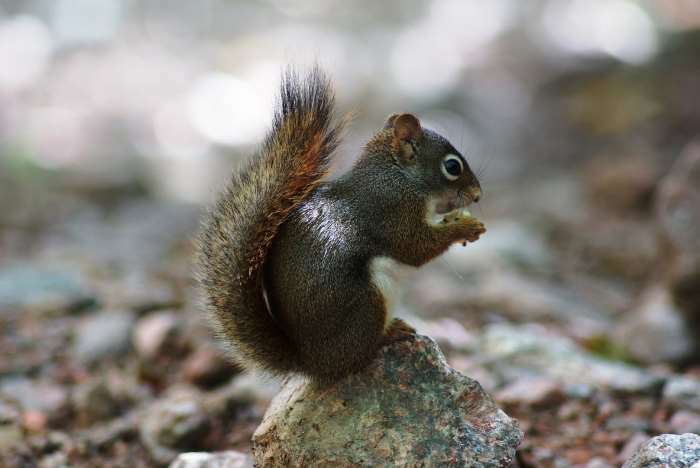 There wasn’t a lot to see on the backside of the loop, although one squirrel was particularly cooperative. I ventured off the trail slightly to photograph this scene, where some fall colors were starting to appear. 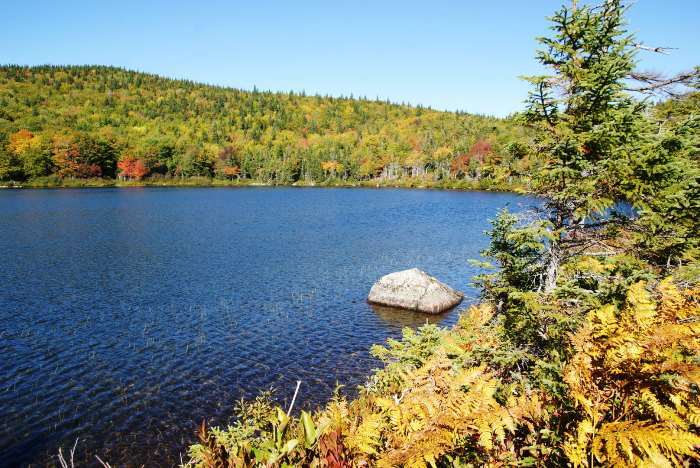 Another short spur trail leads over to a small lake. It’s a nice spot, but I don’t think it would be very easy to hike very far along the shore. 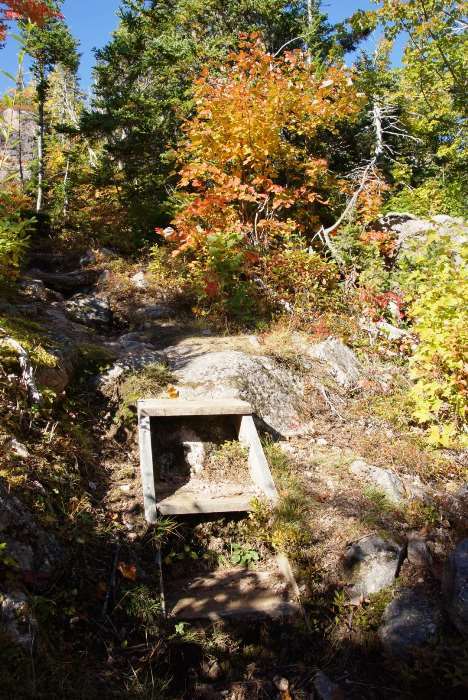 A rough trail provided some access, but it didn’t go far. Still, there’s a nice spot to stand at the water’s edge and admire the changing leaves. Oh, if they had only turned a bit more. Once you get to the gate, you’re not far from the trailhead. 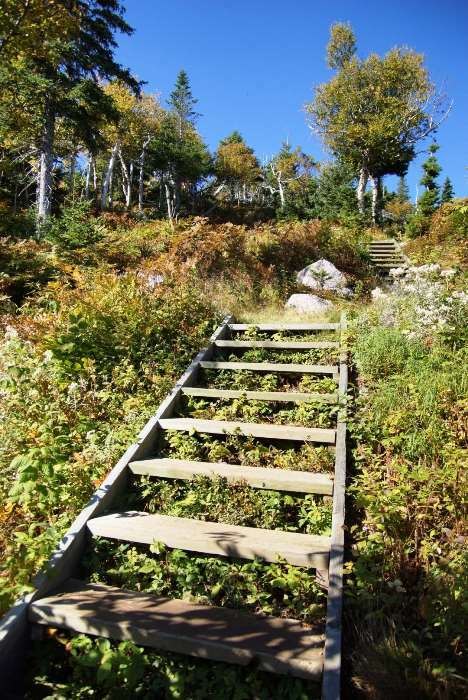 Hop over the barrier and continue down the gravel road, until you’re back at the trailhead. I enjoyed the Franey Trail quite a bit. It’s a good place to find some fall colors, especially if you’re slightly ahead of the peak at other locations in the park. 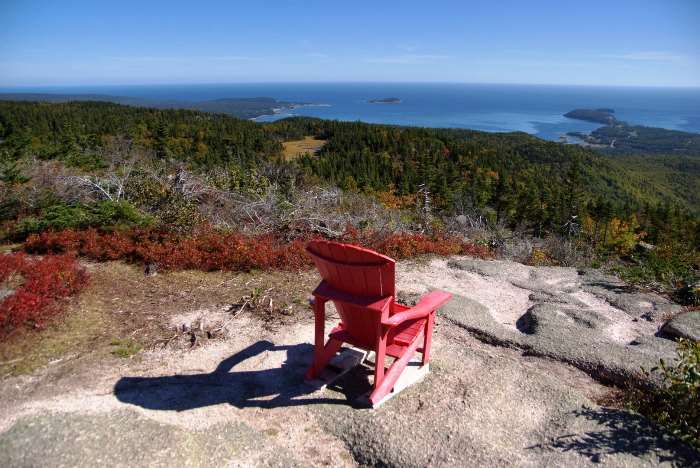 It’s not an easy climb up to the red chair, but the views are quite rewarding. 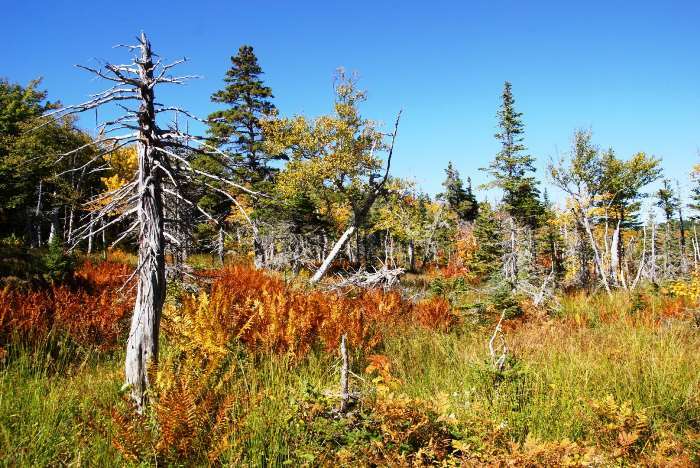 The backside of the trail is less appealing, and you may be able to save some time by backtracking, rather than completing the loop, if you’re in a hurry.